The downtown walking tour was scheduled for a sunny Saturday in April 2016. But the group of about 40 and their UAB student guides soon found themselves reliving another spring morning—Easter Sunday 1963. At Birmingham’s First Presbyterian Church, they sat as the congregation did that day when two African-American women appeared for the holiday service. The city was on edge from nearly a week of protests, and though senior pastor Edward Ramage had not preached racial integration from the pulpit, he did not hesitate to welcome the visitors, unlocking the sanctuary doors that barred them from entering. As current pastor Shannon Webster told the story and pointed out the pew up front where the women had sat, it was easy to imagine them taking an anxious but determined walk down the aisle amid hundreds of staring white faces. (Above) Martin Luther King Jr.'s April 1963 booking photo from the Birmingham Jail. Photo by Birmingham Police Department. (At top) The tour, led by students Graham Palmer and Tyler Heatherly, paused on the steps of the Cathedral Church of the Advent. Ramage’s actions took courage—indeed, a large number of his parishioners promptly walked out, and he later received death threats. But for a frustrated Martin Luther King Jr., scribbling on scraps of paper in a local jail cell a week later, Ramage was only taking baby steps to advance the cause of racial equality and justice. Soon, King would address his “Letter from Birmingham Jail” to Ramage and seven other local clergymen, tying them all together “in a single garment of destiny” that would change the course of the civil rights movement. The tour, which stopped at five other churches, one synagogue, and one parking lot, added dimensions to the famous letter, revealing how the eight pastors and one rabbi prompted King to write—and how they handled the repercussions. 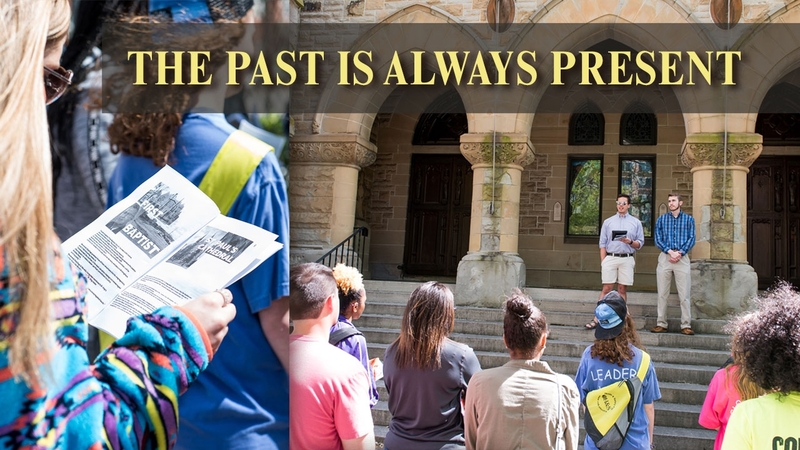 But for the UAB students who developed and led the walk, it also was the culmination of a course that gave them an entirely new way to look at the past. History comes in two flavors, says Pamela Sterne King, assistant professor and director of the undergraduate program in the UAB College of Arts and Sciences Department of History. Academic history, typically published, is aimed at professional scholars. “Public history,” on the other hand, is much more freewheeling, targeting a wider, more diverse audience that includes pretty much everyone. And it appears in a multitude of shapes: markers and memorials, oral recordings, historic preservation, museums and exhibits, and national parks, to name just a few. In her HY 481/681 Public History course, Sterne King helps students to get a handle on the subject. And then they make some public history themselves—in this case, the Letter from Birmingham Jail tour. The walking tour took place on April 16, the 53rd anniversary of the day that King wrote his famous letter. The first thing students discover is that not all public history is created equal. So much depends on who’s telling the story, what parts of the story they choose to include, and sometimes who’s funding the storytelling project, Sterne King says. Looking around Birmingham, for instance, it’s easy to grasp the city’s industrial beginnings and overall civil rights history, but tough to find plaques or memorials mentioning women, she says. “You come away, at least subconsciously, assuming that women didn’t do anything” in Birmingham’s past, which is a “terrible omission,” she explains. Why does this matter? Because public history “helps to create and promote a city’s identity,” says Paige Estefan, a history master’s student from Fairhope, Ala., who took King’s course. Think of places like Philadelphia or Savannah, or Nashville or New Orleans. Each city’s image intertwines with its history. In addition, heritage tourism has become big business, attracting visitors who boost local economies as they travel to museums or historical sites. In the classroom, Sterne King and her students examined ways in which cities present their stories. They also met local historians from the Civil Rights Institute and the Birmingham Black Radio Museum, getting a glimpse of potential careers in the field. Sterne King also shared her own path through public history: She was the first historic preservationist for the city of Birmingham and has played key roles in a multitude of downtown and neighborhood historic revitalization projects. Public history is “a balancing act” that must take into account the community’s current views on a subject, says Robert Austin, a senior history major from Oneonta, Ala., in Sterne King’s class. “You want to try to challenge some widely held beliefs to show that there is more to the story, but you also want to attract the public.” And researching historical events can lead to different opinions and interpretations, he adds. “Whose version of history is more valid? I am not sure there is an answer to that question." Pastor Shannon Webster (at right) shared the story of Easter Sunday 1963 and Pastor Edward Ramage's reaction to King's letter during a tour stop at First Presbyterian Church. With the walking tour, the students started from scratch. “Their job was to figure out what we need to highlight—to decide the points they want to make about the 'Letter from Birmingham Jail' and how to illustrate those,” Sterne King explains. One group of students researched the eight clergymen and the congregations they led; another concentrated on developing the photos, maps, text, and scripts needed for the tour and an accompanying brochure. For a document that outlined the moral foundations of the fight against segregation and is quoted by civil rights leaders and school children worldwide, the letter surprisingly hasn’t received the attention that other moments from the 1960s have, Sterne King says. (A historical marker was placed at the jail site only in 2013.) That surprised Estefan, who helped to organize the student groups, researched and wrote the tour introduction, and filmed the event. “The letter has had a lasting effect on Birmingham; it really shook things up here,” she says. At each site on the walking tour, the student guides described the letter’s effect on the men and their congregations. Most, understandably, were upset by King’s remarks. Milton L. Grafman, rabbi of Temple Emanu-El, worried that the letter branded him a bigot, but continued to support racial and religious inclusion. Ramage, deeply affected by King’s words, maintained a commitment to integration in spite of church and community bullying and, suffering poor health, left the city later in 1963. Pastor Webster noted that First Presbyterian now embraces Ramage’s example, inspiring both its ministry and outreach efforts. Perhaps the most poignant stop was the empty parking lot on the corner of 6th Avenue North and 22nd Street, once home to the large, turreted Birmingham First Baptist Church. Its Reverend Earl Stallings, who also welcomed African-Americans on Easter Sunday 1963, became a target for both segregationists and integrationists, and he left Alabama two years later. In 1970, the church split over the prospect of admitting African-American members; in the following decade, the remaining congregation moved, and the building was demolished. The tour visited First Methodist Church, whose leaders in 1963, Paul Hardin Jr. and Nolan Harmon, helped to orchestrate the writing of "A Call to Unity." That statement, which criticized civil rights protests, spurred King to write the "Letter from Birmingham Jail." Sterne King plans to make a self-guided version of the Letter from Birmingham Jail tour available to members of the public and city visitors. With support from the Rita P. Kimerling Public History Endowment in the Department of History, she will publish a professionally designed brochure and map based on the students’ work that can be distributed around the city and state. She hopes it will be the first of a series of new heritage tours created by her students. Future installments might focus on “bad women” or Communism in the city’s history. "Injustice anywhere is a threat to justice everywhere. . . . Shallow understanding from people of good will is more frustrating than absolute misunderstanding from people of ill will. Lukewarm acceptance is much more bewildering than outright rejection." —Martin Luther King Jr., "Letter from Birmingham Jail"
• Find many more cool classes in the College of Arts and Sciences. • Discover the full range of academic opportunities available in the Department of History. • Give something and change everything for UAB history students by supporting scholarships and academic programs.